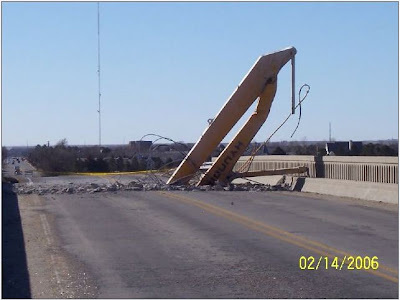 A backhoe weighing 22 tons is on top of a lowboy trailer and heading east on Interstate 70 near Hays, Kansas . 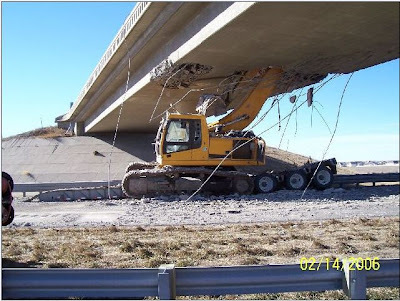 The extended shovel arm is made of hardened refined steel and the approaching overpass is made of commercial-grade concrete, re inforced with 1 1/2 inch steel rebar spaced at 6 inch intervals in a criss-cross pattern layered at 1 foot vertical spacing. 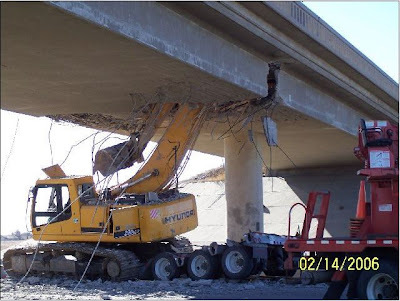 When the shovel arm hits the overpass, how fast do you have to be going to slice the bridge in half ? Solve for the time and distance required for the entire rig to come to a complete stop after hitting the overpass at the speed calculated above. Yes, you can neglect friction.